The Leadenhall Building, London’s new star skyscraper, crystallises Richard Rogers’ design philosophy and may be his practice’s finest high-rise yet. Despite realising a concept that’s more than a decade old, and being informed by even older principles forged in the high-tech revolution of the Seventies, this is structurally and symbolically a building facing into the future. They will never meet, but the Cheesegrater was made for Ye Olde Cheshire Cheese. 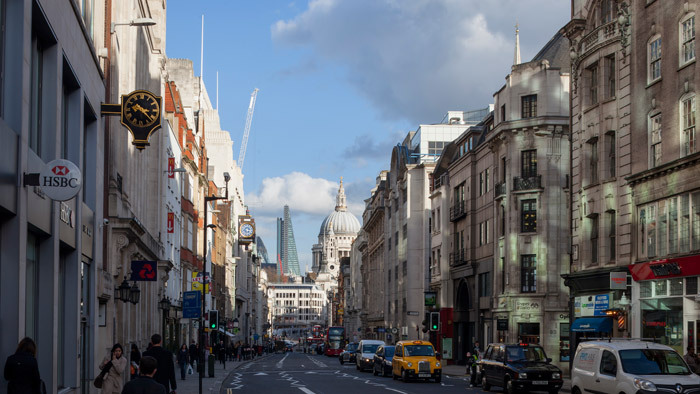 The latter is the London pub where drinkers , stepping out from its 17th-century jumble of rooms, have beheld a remarkable view ever since 1710: St Paul's Cathedral, dominant in the distance beyond Fleet Street. 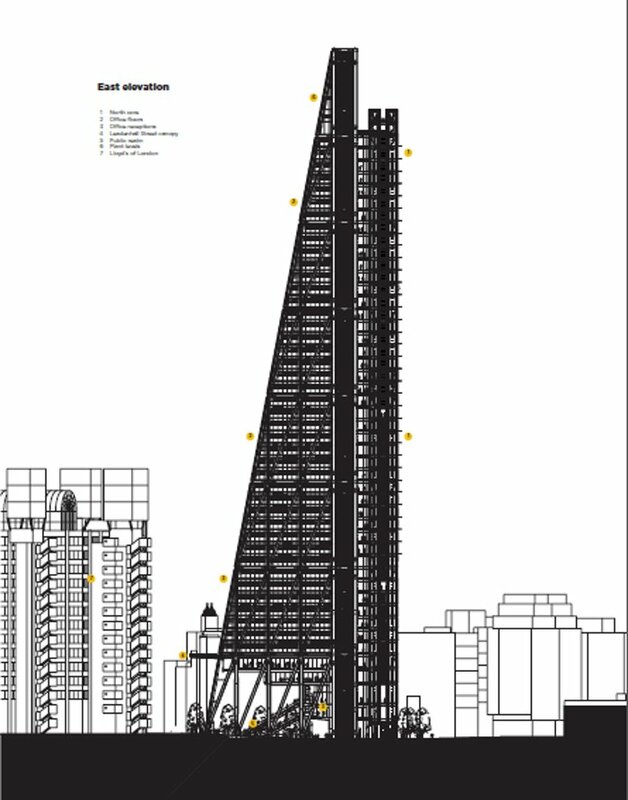 Now, the £500m 'Cheesegrater' (as everybody calls the Leadenhall Building) is the new master of the City of London skyline, a dark, crystal tower rising 224.5m -- just over twice as high as St Paul's. Yet with its profile leaning away from the cathedral at a gentle 10.6 degrees to the vertical, the historic view is preserved. Much more visible are the Pret a Manger sign next door and the clock cantilevered from the 1930s Daily Telegraph Building just beyond it. The 'Cheesegrater' as see from Ye Olde Cheshire Cheese -- luckily the two will never meet. The story starts directly across Leadenhall Street, at Lloyd's of London, completed in 1986. Following the Centre Pompidou in Paris (co-designed with Renzo Piano), this was Rogers' first major UK commission and his first high-rise design to be built, (although at 84m high, it is now considered mid-rise). 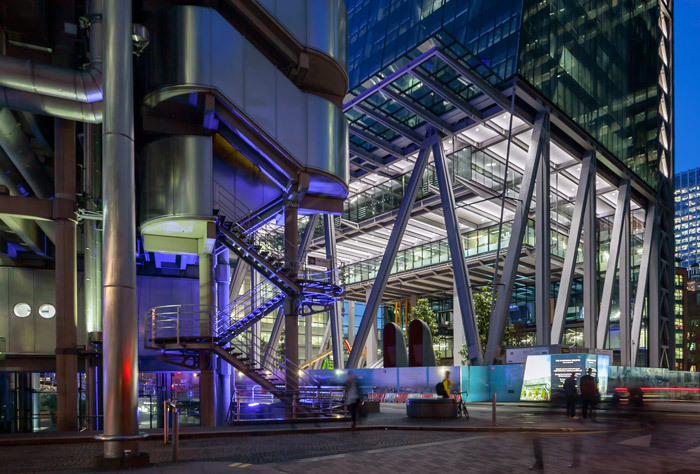 Lloyd's introduced high-tech architecture to the UK with a bang. Stirk worked on the Lloyd's Building and went on to play a major role in another City office block, which by contrast was very transparent and playfully colourful: '88 Wood Street,' he says, 'was the first time we were using the jellyfish approach to visibility.' -- with a transparent skin revealing the inner structure. Sculptural expression remained, but was more calmly rational than at Lloyd's. Next to three conjoined slabs of office space, separate service towers rise, showing off their yellow internal steelwork and panoramic lifts. Outside, large ventilation funnels are painted blue for taking in fresh air, or red for discharging exhausted air. All these elements are treated very similarly on the Cheesegrater, but the formula is repeated on a far larger scale, and the high-tech design ethos has had a further evolution, summed up by Stirk: 'Legibility through revealing, rather than sculptural expression'. British Land held a competition for the Leadenhall site in 2001, only two years after 88 Wood Street's completion. Stirk's winning design was literally shaped by an analysis of the site. To comply with the constraints of St Paul's viewing corridors from the west, the solution was to incline the south side so it leaned out of the way, which also prevented an overbearing volume looming over Lloyd's across the road. Naturally, Rogers would separate services. Here they became the entire north side of the building. 'This is a product of wind testing,' notes Stirk, recalling two trips during the design development days to Toronto where air flows were simulated. All buildings in the vicinity were modelled (including a proposed 63-storey twirly cylindrical tower next door by American architect Helmut Jahn, later replaced with the even twirlier KPF-designed Pinnacle, which has never proceeded further than the current eight-storey stub of concrete core). 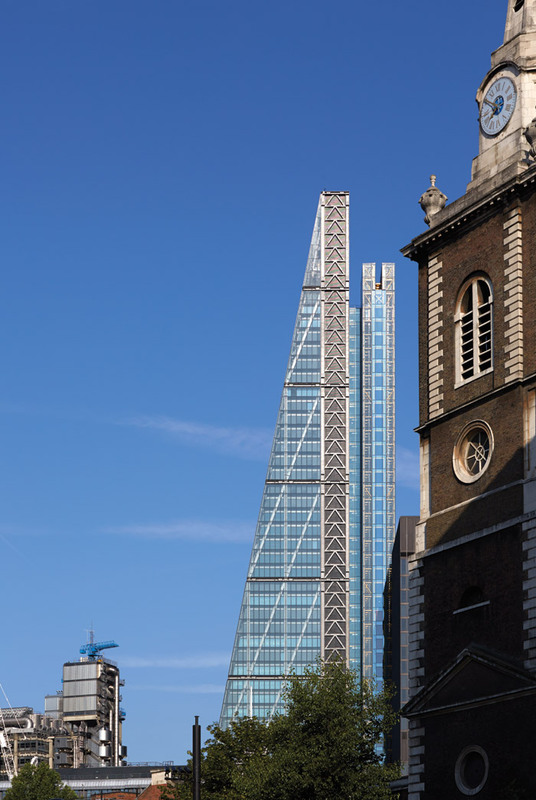 The wind analysis shaped the Cheesegrater's great glass canopy above Leadenhall Street, preventing downdraft from the south-facing sloping facade, as well as the screens beneath the building itself, as we shall see. 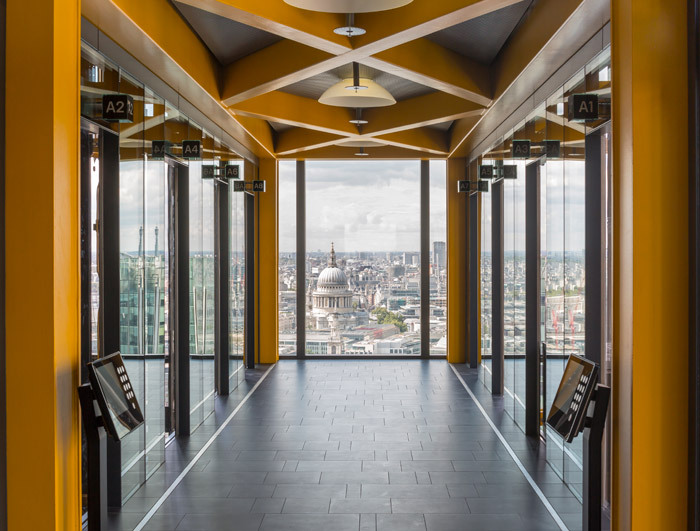 A yellow table, one of 139 stacked to create the north core, here forms a lift lobby and frames Christopher Wren's 111m-high St Paul's Cathedral. When the Leadenhall plans were revealed in 2004, London was simultaneously excited and panicked about new skyscrapers. 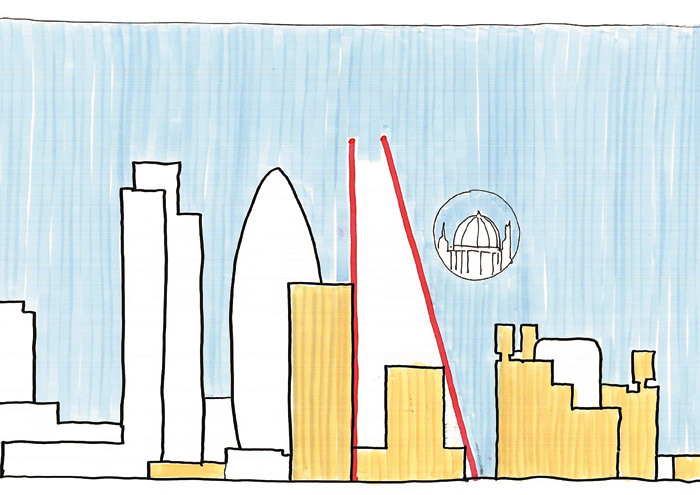 The Gherkin was new, and English Heritage had recently lost public enquiry challenges to the Heron Tower and The Shard. Another battle was expected, but surprisingly the Cheesegrater was a shoo-in. Few minded losing the 13-storey GMW-designed P&O Building (1969), although it was designed as a companion to the 118m-high Aviva Tower, which is itself admired for bringing pure Miesian black-glassed aesthetics to London. It now stands unfeasibly close to the Cheesegrater's north-east corner. 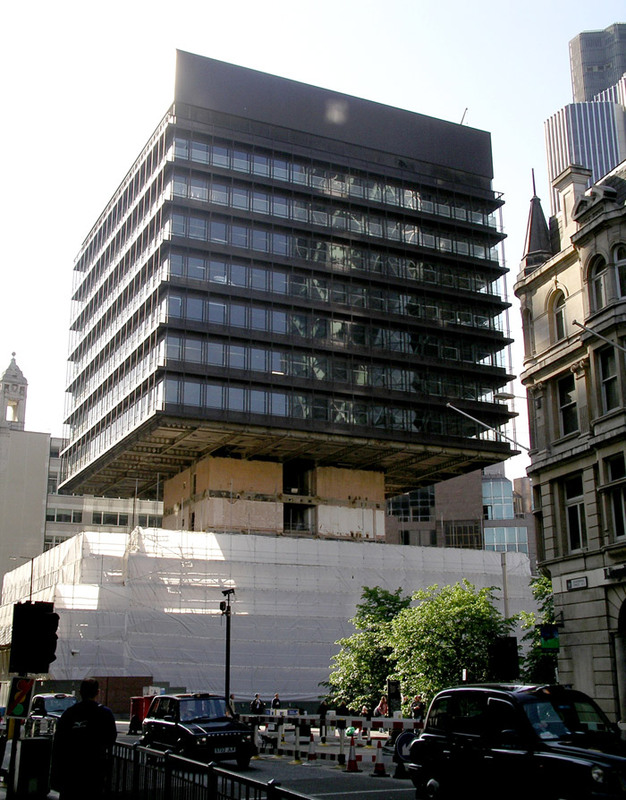 When the P&O Building was finally demolished in 2007, floors were removed from the bottom up, almost as if predicting the ground space that its replacement would open up. Contractor Laing O'Rourke moved on site in 2011, and the new tower was topped out in 2013 and finished this summer. The Cheesegrater's triangular-sided wedge form tapers to a linear apex and contains 42 floors of office that diminish with height from more than 2,000 sq m to less than 600 sq m. They span a rectangular-plan, prism-shaped, perimeter steel tube, the megaframe, carrying the main building load (there's no concrete core as in conventional skyscrapers). Within this is another steel frame, the orthogonal 'strongbox' core, appearing as up to six columns in lower floors. The exterior megaframe is defined by diagonal cross-bracing making a giant diagrid of 56m-high diamonds, held together with massive precision engineered nodes. 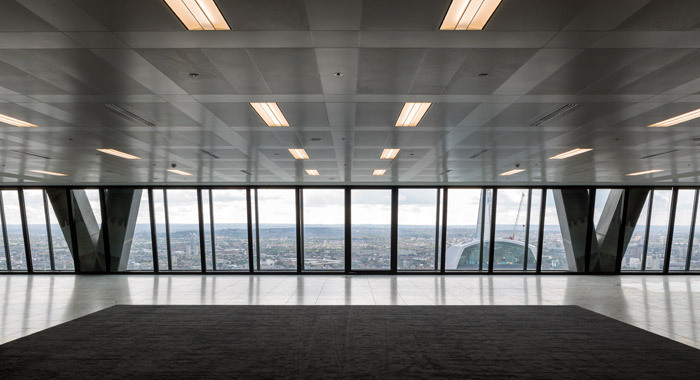 The megaframe divides the Cheesegrater into eight 28m-high sections, each containing seven office floors, except the lowest and highest sections, more about which later. The office floorplates are indented at their northern corners to accommodate fire lifts and escapes, within externally exposed, continuous storey-high K-bracing. 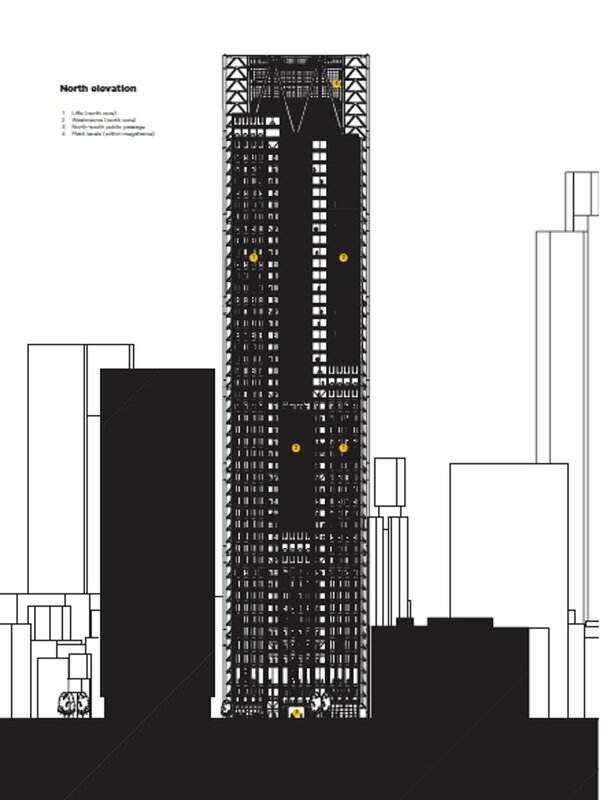 The whole tapering structure is connected to a 204m-high, north-facing service slab containing the core services, washrooms and lifts, built of stacked prefabricated yellow steel 'tables'. The megaframe and the modular north core are state-of-the-art examples of a worldwide high-rise construction trend to use prefabricated components -- about seven-eighths of the Cheesegrater was fabricated offsite, a proportion that has been exceeded only in China. The Cheesegrater is Big Glass -- 70,000 sq m of it. It can reflect the sun like a giant smooth-angled dress mirror. The double-glazed offices are separated from a third, outer layer of glass, which reveals the megaframe. Along the exposed steelwork defining every vertical section the air-gap is vented to provide an element of convectional cooling. The corner bracing on the vertical edges are unglazed, and those K-structures stack up on their side. On the north core, we get colour as well. 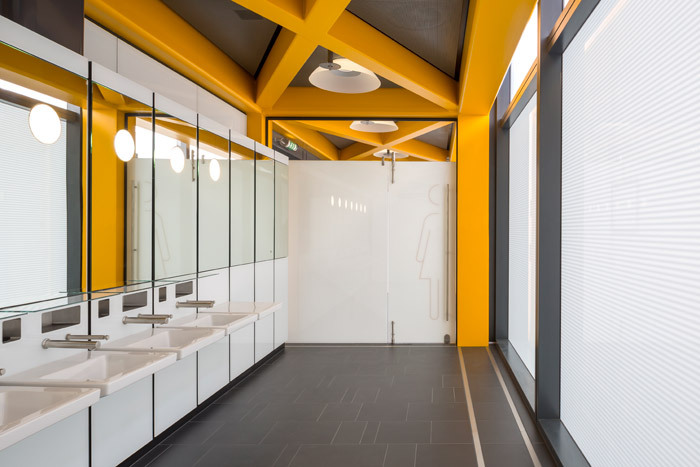 Glazing reveals the yellow tables, and washrooms show as red for women, blue for men -- Stirk reports that a City churchman compared the facade to a stained-glass window. The moving lifts and counterweights make it kinetic as well. 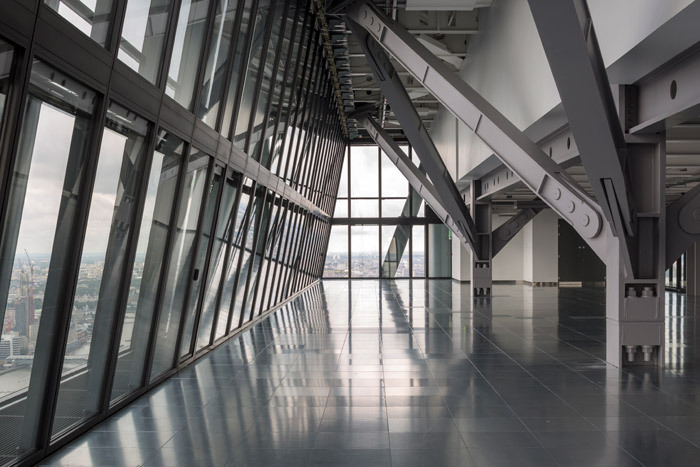 A building like The Shard is super-transparent, but here you see not just into the interiors, but the services and the very structural engineering too. There are four underground levels, which include parking for just 22 cars and, more relevant to the contemporary city, 394 cycles and 129 motorbikes, with their own ramp. 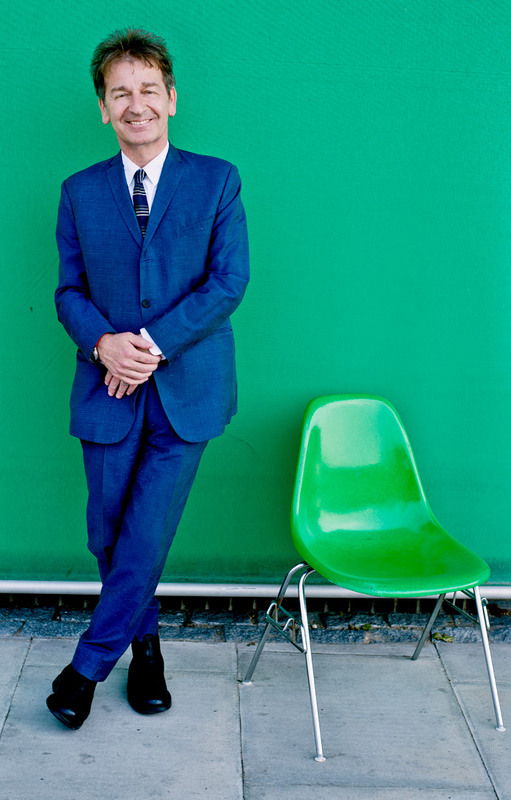 RSHP's September tour saw Rogers in a characteristically bright-green shirt and Stirk in his habitual collarless jacket. It began literally under the building. Nowadays, how a skyscraper interacts with the ground is considered as important as the gee-whizz effects of its height and form. Many skyscrapers drop sheer down with a thump, for example Mies van der Rohe's. He played with proportion, materials and sculpture to make an art form of 'plaza gain' (where the city allows a higher building in exchange for gaining a plaza), as at Manhattan's Seagram Building, but few other modernists gave public realm much heed. Other skyscrapers are mounted on low-rise podiums, as if to pretend the tower wasn't really part of the streetscape at all. 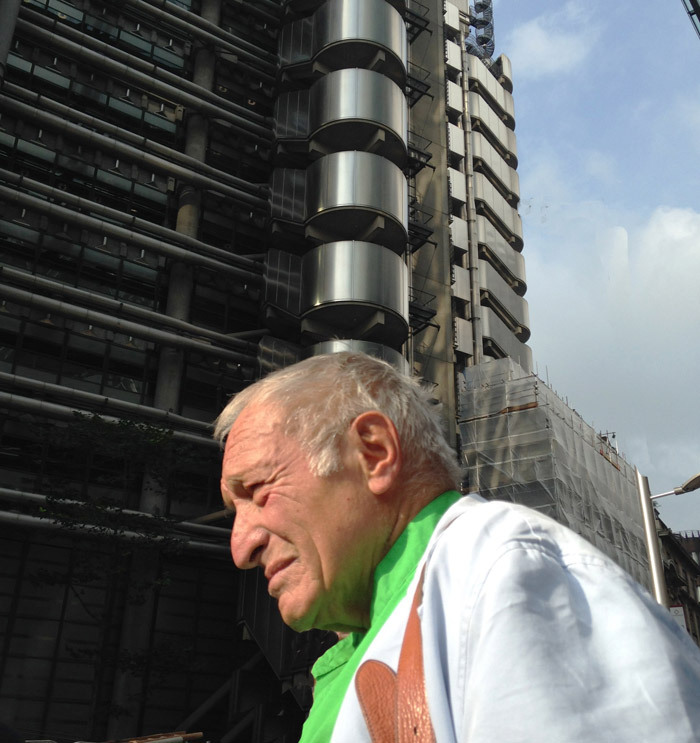 Stirk says that with the Cheesegrater, 'rather than create a podium, we created a cut'. Behind outward-looking ventilation funnels, here up to 6m high and coloured only on their air-faces, an east-west plaza of sorts has been gained in the 28m-high void of the megaframe's lowest section. 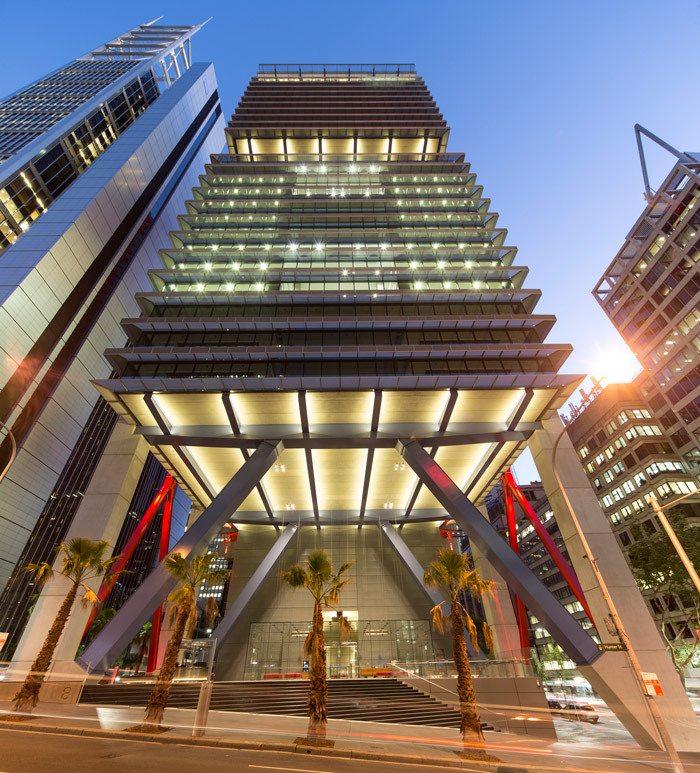 A similar void was created under 8 Chifley, an RSHP-designed, 34-storey tower opened in October in Sydney. Stirk says: 'Chifley Square is virtually identical... The ground-level experience is not as large, but the same.' Well, not exactly the same -- for example, in London, restaurant units frame a ground-level passageway to the north. That was suggested by Peter Rees, the influential, now retired, City planning supremo, and it will create big flows of people. More visibly, two sets of escalators rise from the plaza. Each reaches different levels of office reception suspended from the section above, one reception being exclusively for Aeon, an insurance company, to which the lowest office floors were pre-let. The escalators and public realm recall Norman Foster's HSBC Building in Hong Kong, built at the same time as Lloyd's -- perhaps the Cheesegrater's public realm could also become a camp for anti-capitalist protest, although it is more fragmented. 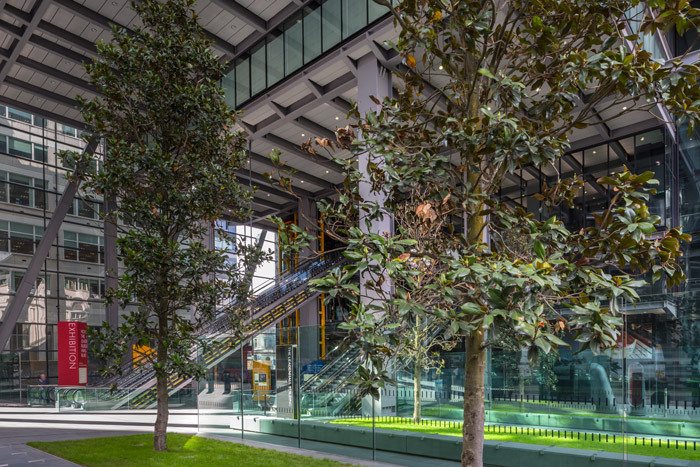 There's also a patch of trees and grass under the building, which is curiously divided with glass-screen windbreaks, and even more curious, the garden disguises a hatch that would open up as a fire exit from the Aviva Tower. Next year this garden will connect to the adjacent St Helen's Square, which is being re-landscaped by Gillespies to bring nature and the changing seasons closer (and compete with the veritable wraparound of surrounding skyscrapers, including the Gherkin and even taller KPF-designed 'Scalpel', now under construction). Past the raised reception floors, you cross to the corridor running along each level of the north core, framed in yellow by the tables that make it. This is the lift lobby, and houses the toilets. The 22 scenic lifts, set in three banks, sense your weight and are the fastest yet, ascending up to 8m a second to reach level 45, the highest offices, in just 30 seconds. 'There's a great deal of daylight,' notes Rogers, stepping out there into the plain rectangle floor. Office floors demonstrate Stirk's comment that, 'our buildings are boring in plan, interesting in section'. And there is no colour here -- offices are offered in shades of grey. Who needs colour with the view on offer here? At this height, 196m, there is a sense of detached power looking down on London. The Gherkin is below. 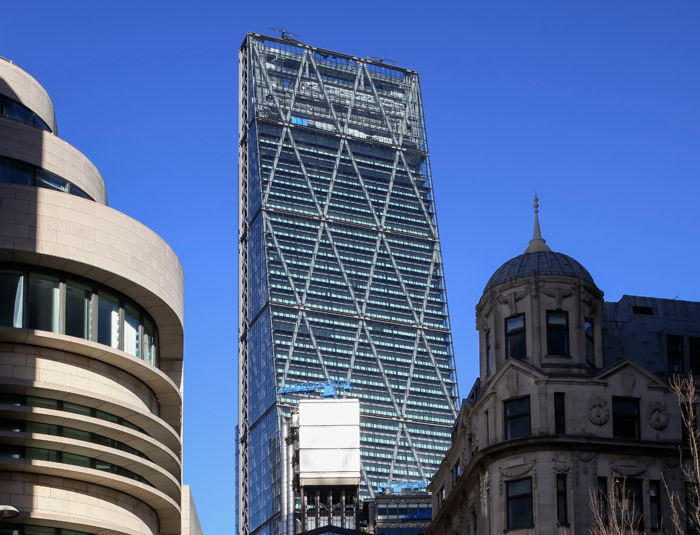 Foster and Rogers have long competed with high-rise in the City (and elsewhere), but Rogers says it is 'friendly competition' and offers that 'the Gherkin is great skyline'. The real competition -- commercially as well as visually -- is just to the south: the nearly complete 20 Fenchurch Street, aka the Walkie Talkie. The Rafael Viñoly-designed tower, though only 160m high, demands attention because its voluptuous, curving form widens with height. If the straight-edged Cheesegrater leans away with dignity, the Walkie Talkie is pushy, puffing itself out, looking for a face-off. Asked his opinion of it, Rogers commented: '... it has interest. My problem is that it blocks views.' From the Cheesegrater, it blocks off much of The Shard, the only skyscraper to climb substantially higher into the sky. In the City itself, the Salesforce (previously Heron) Tower is tallest, beating the Cheesegrater by 5.5m, but only because it cheats with a 28m-high vanity mast. Height is not everything, Rogers suggests, musing that in late-medieval times, families in the Italian city of Lucca built towers to show off their wealth and, to be the tallest, 'put oak trees on top to increase the height'. Above the offices, the megaframe still delivers a whole further section of extra height, given to plant machinery -- the equivalent of those metal boxes mounted around the Lloyd's roof. From the street, blocks of blue and red on level 46 are clearly visible in the crystal vitrine of glazing. 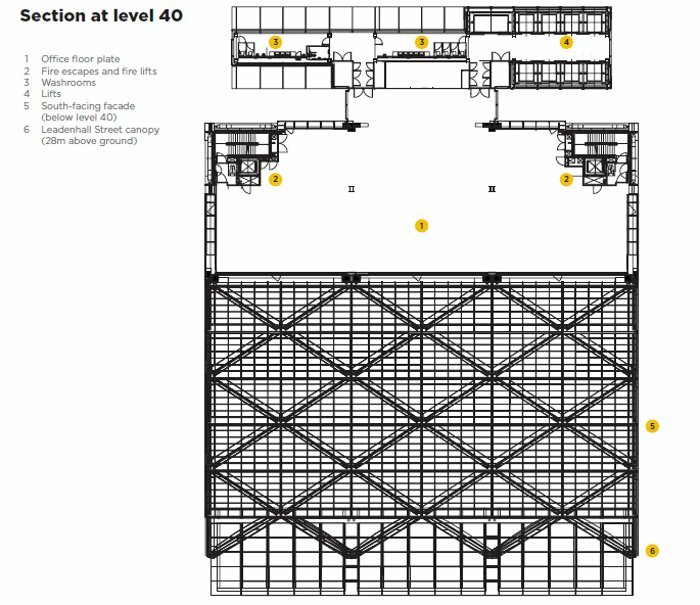 Level 48 is the highest floor of all, a linear platform with pipes, tanks, coolers and other equipment facing the sky, simultaneously industrial and unearthly. Above the roofline, two cranes are mounted, from which window-cleaning gondolas can be lowered, which run on skis in mullion guide rails if cleaning the south slope. When the cranes are up and aligned with the roof, they look like eyebrows. 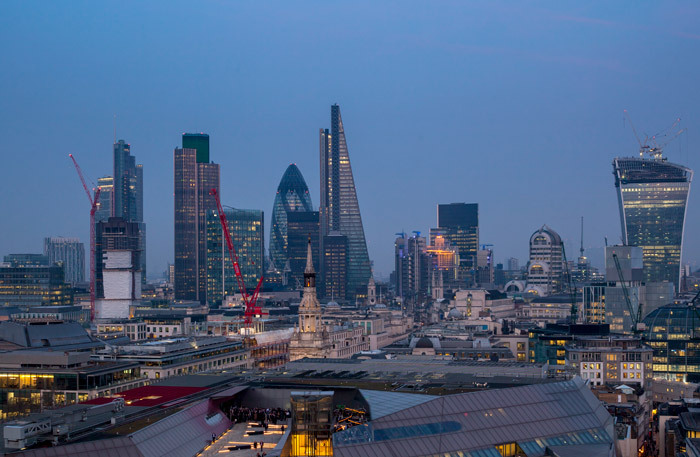 The Cheesegrater, Shard and Gherkin are each unique, iconic and symbolic of London's get-ahead outlook. All three have high-tech roots, but the Cheesegrater remains truest to them, revealing the intricate, intimate joy of its operations to anyone who looks up -- even from under the building itself.